Annandale, located about 12 miles outside of the nation’s capital, looks like an average suburb. The “downtown” area consists of a few aging strip malls. Big-box chains, restaurants, and of course, expansive parking lots fill up the space. 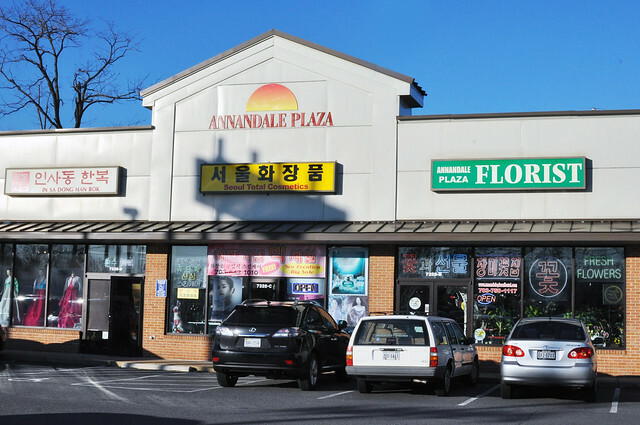 But take a closer look at the businesses tucked into these strip malls and you’ll notice something very different about Annandale: most of the signs are in Korean. Annandale is the Washington D.C. metropolitan area’s Koreatown. Its Korean immigrant population is estimated to be around 70,000 and growing. The sleepy suburb has been reinvigorated by small immigrant-owned businesses and mom-and-pop restaurants. Foodies from all over the region brave the poorly serviced public transportation and rush hour traffic to grab a meal (or two) in Annandale. As a Korean American raised in Northern Virginia, Annandale has always been a second home. The businesses listed below are a couple of the mainstays that I frequent with my family and friends. Secluded behind a Burger King, inside what appears to be a repurposed office space, Lighthouse Tofu is a simple traditional restaurant with ancient Korean character wallpaper and wooden furniture. 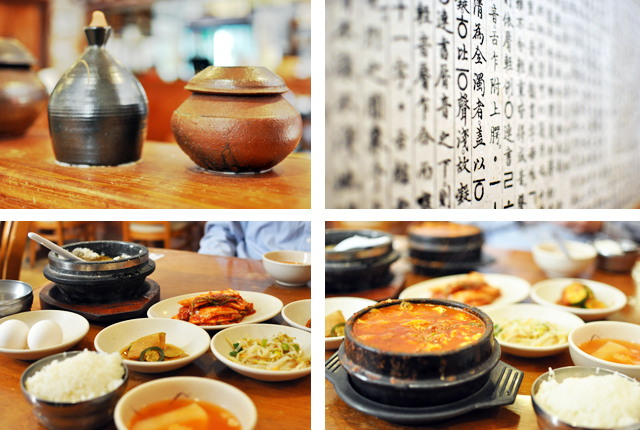 The house specialty is soondubu, soft tofu soup served in a hot stone bowl with a side of rice. You can choose your degree of spiciness (white, medium, spicy, very spicy) and your main ingredient (seafood, mushroom, meat, all mixed). The medium “all mixed” is my mom’s go-to combination. You’ll be served some complementary small cold dishes, called banchan, which are shared with everyone around the table. Halfway through digging into the sizzling bowl of soodobu, you might forget you are in Northern Virginia. If you’re especially hungry, I recommend any of their pancakes. But don’t forget to save room for dessert! A quick drive around the corner is Le Matin De Paris. Although it looks deceptively Parisian on the outside with eiffel tower-inspired decorations, it’s actually a quaint Korean cafe with freshly baked fusion pastries (taro puff?!) 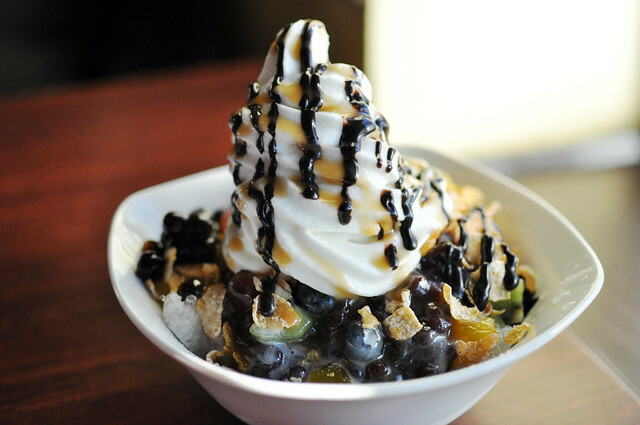 and bingsoo, a popular Korean shaved ice dessert. Customers stick around to work on their laptops while sipping iced coffee, and groups of friends come in to share big bowls of bingsoo. To the left of the bakery is Rainbow Foods, a small catering business. Many Korean American churches, businesses, and families rely on places like Rainbow Foods for hearty catered feasts. For anyone missing homemade Korean side dishes or snacks, Rainbow Foods offers a selection of in-house handmade kimchi, rice cakes, dumplings, and savory pancakes that you can take home. If you’re also looking for staple ingredients at a bigger grocery store, head over to H Mart. They have everything from 50-pound bags of Korean sticky rice to imported spices, all at reasonable prices. 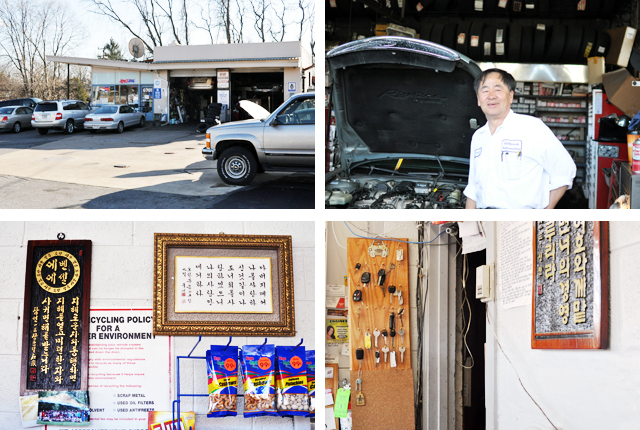 A small and unassuming gas station and auto repair shop has been owned and run by the hardworking Choi couple for nearly 20 years. It’s no wonder they’ve been in business for so long; loyal customers gather there to talk and see friends. Hillbrook Automotive is one of Annandale’s hidden pockets. The cozy store, adorned with bible verses in Korean, offers plenty of seating for the auto shop’s visitors. Chatting in a mix of Korean and English, everyone seems to know each other. Mr. Choi shared stories with me about how Annandale used to feel like a desert for new businesses, dying to survive. Two decades later, he can hardly believe the same town has transformed into a cultural melting-pot. Honey Pig is a 24-hour Korean barbecue restaurant serving grilled meat to an exploding fan-base. It opened in 2008. The entrance is somewhat hidden from the road, but if you drive towards the neon pig glowing from a distance and look out for a large parking lot, you won’t miss it. Honey Pig is loud. Korean Pop songs pump through the speakers and meat sizzles at every table. It’s a guaranteed fun meal out with friends or family. After Honey Pig BBQ, you either fall into a food coma or leave feeling magically reenergized. If you fall into the later category, walk next-door to Dain Cafe & Karaoke to take your visit to the next level. It’s a Korean-style karaoke venue, which offers spacious private singing rooms priced by the hour, complete with tamborines and excessive disco lighting. While they have a great English language song selection to choose from, don’t pass up the neverending list of Korean pop songs. Most video accompaniments, whether you choose an English or Korean song, are random Korean music videos from the eighties and nineties, adding to the experience. You can belt out your favorite tunes as loud as you want into the early morning, in the privacy of your chosen company. Don’t worry if you are still hungry, because you can always order drinks or snacks (they have crispy Korean fried chicken). “Have you eaten yet?” is a common Korean greeting among friends and family. It’s the way my parents begin each phone conversation, especially now that I live away from home. A guide to Annandale’s Koreatown reveals just how essential meal times are, especially in Korean and Korean American culture. From the etiquette of refilling each other’s barley tea to sharing banchan across the table, each meal offers a place and time for conversation and cultural exchange. Annandale’s small immigrant-owned businesses are expanding, translating their menus, and catering to an increasingly diverse group of eaters from all over the region. Slowly but surely, more and more vacant strip mall store fronts and aging office buildings are becoming transformed into lively places for people to gather and form a diverse community, one hearty meal (or two) at a time. Unless otherwise noted, photos and post by Sewon Christina Chung. What would a day in your hometown look like? Check out A Day in Gainesville, Florida; A Day in Berea, Kentucky; and A Day in Oakland, California. Wow! This sounds like heaven…I want to go there!